Mostly used as take off conveyor for the warm extruded product. The special belt deck will be cooled with chilled water and thus preventing temperature rise of the belt and stickiness of the product. These tunnels are used for thoroughly cooling down the products. 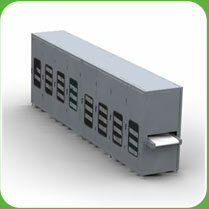 Inside this modular system the cooling air is directed above and below the open belt conveyor system. When closed belts are preferable we use water cooled decks. In order to minimize floor space and maximize efficiency we also deliver multiple level (3 or 5) cooling tunnels. Cooling principles are similar to the single level cooling tunnel. In order to minimize transport and production cost we often only design the cooling system and you can outsource the fabrication locally under our supervision!